Toilet: Ek Prem Katha released in China on Friday and started off on a very good note, reported trade analyst Taran Adarsh. Akshay Kumar and Bhumi Pednekar's film was released in China as Toilet Hero and it debuted at #2 at the box office, collecting $ 2.36 million (Rs 15.94 crore) on its opening day. "Market for well-made content-driven Indian films continues to bloom in China... 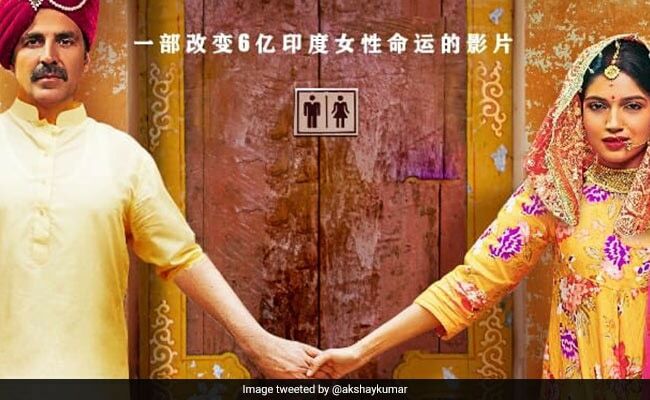 Toilet: Ek Prem Katha - titled Toilet Hero for Chinese audiences - starts off very well... Debuts at No 2 at China box office...Friday $ 2.36 mn (Rs 15.94 crore), Shows: 56,974, Admits / Footfalls: 496,483," Taran Adarsh tweeted. Toilet: Ek Prem Katha received a bigger opening than films like Hindi Medium and Bajrangi Bhaijaan. The film is being screened in 11,500 screens across the country with approximately 56,000 shows every day, according to Taran Adarsh. "Exclusive: 11,500 screens... 56,000 shows every day (may go up to 58,000 shows)... Toilet: Ek Prem Katha opens in China today (8 June 2018)... Much larger release than Hindi Medium and Bajrangi Bhaijaan in China...Titled Toilet Hero for the local audiences," tweeted Mr Adarsh. #Xclusiv: 11,500 screens... 56,000 shows every day [may go up to 58,000 shows]... #ToiletEkPremKatha opens in China today [8 June 2018]... Much larger release than #HindiMedium and #BajrangiBhaijaan in China...Titled #ToiletHero for the local audiences. Taran Adarsh also shared a fresh poster of the film featuring both Bhumi and Akshay. "And here's the new poster of Toilet: Ek Prem Katha for the local Chinese audiences," tweeted Taran Adarsh. A "delighted" Akshay Kumar announced the release of Toilet: Ek Prem Katha and tweeted: "Delighted that our film Toilet: Ek Prem Katha is continuing to break new grounds and is all set to release as Toilet Hero across 4300 screens in China on 8th June." Actress Bhumi Pednekar also tweeted about the release of the film in China: "Toilet Ek Prem Katha, this special film releases in China today and I'm so excited. Thank you again for all the love and support we have already got and really hope that we get the same all over again." Toilet: Ek Prem Katha hit the domestic box office in August 2017 and had won accolades for choosing to showcase an unconventional story, highlighting the problem of open defecation in the country. Akshay and Bhumi play a newlywed couple, who head for splitsville after the duo have a fight over the absence of a toilet in the house. Helmed by Shree Narayan Singh, Toilet: Ek Prem Katha is co-produced by Neeraj Pandey and Akshay Kumar. The cast also includes Anupam Kher.